“(Pittsburgh) – In honor of what would have been Mister Rogers’ 80th birthday on March 20, Mr. McFeely — aka David Newell, the public relations director for Family Communications, Inc. (the nonprofit company founded in 1971 by Fred Rogers) — has a special request. It just so happens that Sweater Day is part of Pittsburgh’s 250th anniversary celebration and the first-ever “Won’t You Be My Neighbor?” Days (March 15 — 20). “We wanted to recognize Fred in a way that would reflect his deep appreciation of what it means to be a caring neighbor,” explains FCI’s Margy Whitmer. As a result, “’Won’t You Be My Neighbor?” Days — WYBMND for short, although not by much — was born as a means of promoting neighborliness throughout Fred Rogers’ own backyard — Southwestern Pennsylvania region. In 1969, Rogers appeared before the United States Senate Subcommittee on Communications. His goal was to support funding for PBS and the Corporation for Public Broadcasting, in response to significant proposed cuts. In about six minutes of testimony, Rogers spoke of the need for social and emotional education that public television provided. He passionately argued that alternative television programming like his Neighborhood helped encourage children to become happy and productive citizens, sometimes opposing less positive messages in media and in popular culture. He even recited the lyrics to one of his songs. The chairman of the subcommittee, John O. Pastore, was not previously familiar with Rogers’ work, and was sometimes described as gruff and impatient. However, he reported that the testimony had given him goosebumps, and declared, “Looks like you just earned the $20 million.” The subsequent congressional appropriation, for 1971, increased PBS funding from $9 million to $22 million. 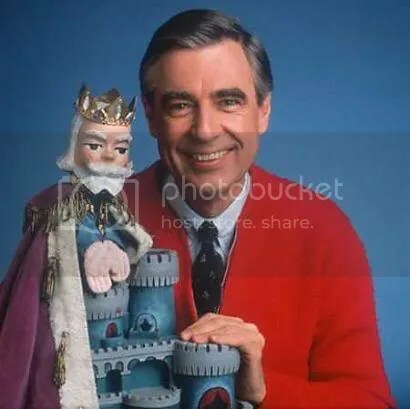 Among other astonishing tidbits of wisdom — like, say, a behind-the-scenes look at how crayons are made — Fred Rogers provided me with my very first lesson on how you can totally and completely love someone with all your heart…even someone you’ve never met. In the early 1990s, I read a newspaper story about Mr. Rogers’ stint as the main guest speaker at the graduation ceremonies of some fancy Ivy League college back East. I smiled as I read that he was overwhelmingly chosen — from among a rather large field of quite renowned and impressive possible candidates — by the graduating students themselves. However, because of the great affection that I felt for this man, as I read the story I distinctly remember also feeling a small, but palpable twinge of fear in my chest — fear that perhaps this bored, jaded, favored, overly-educated, disenchanted slice of my generation had chosen him to speak at their college graduation as some supreme statement of kitsch, or even as an opportunity to poke fun at his tender, gentle ways in a very public forum. When I got to the part about him walking to the podium to begin his speech — in that purposeful, patient, and unhurried walk of his that we all know so well — the protective concern that I was feeling instantly shifted into a sense of great pride, relief, and community. They hadn’t let me down. And I began to weep. And I weep again, even now, just remembering it. They hadn’t invited him there to their hallowed halls to make fun of him at all. They had invited him there, with great reverence, to pay him tribute. He had — one song, one smile, one loving word at a time — been a part of each of their journeys to adulthood. They had asked him to be there, on this symbolic last day of their childhoods, because they loved him. Those thousands of voices raised in song were a profound and heartfelt “thank you” for the many years that he gave them his kind, patient, and undivided attention. A voice that was there, everyday, even when parents or friends weren’t. A voice that, to a tragic few, may have been the only loving and reassuring words they might hear all day. I miss him, and his kindness…his cardigan and his sneakers…his calm, sweet voice and his silly puppets. But most of all, I miss his unfailing belief that all things are possible. That simple, glimmering truth was his gift to us all. Thank you, Mr. Rogers — and Happy Birthday.